James Steventon is Director of Fermynwoods Contemporary Art, having previously been Education Officer for the organisation since 2008. James is an artist, writer, and runner, based in Northamptonshire, a lecturer at The Sir John Cass School of Art, Architecture and Design at London Metropolitan University, and Digital Special Interest Representative for Engage. James originally studied Fine Art at London Guildhall University but actively undertakes professional development in subjects ranging from Computer Science, Big Data and Social Physics to Hide Tanning and Wilderness Survival. I have a complicated relationship to the word. I would describe myself as an artist rather than a curator, and I think that is an important distinction as it informs my approach. 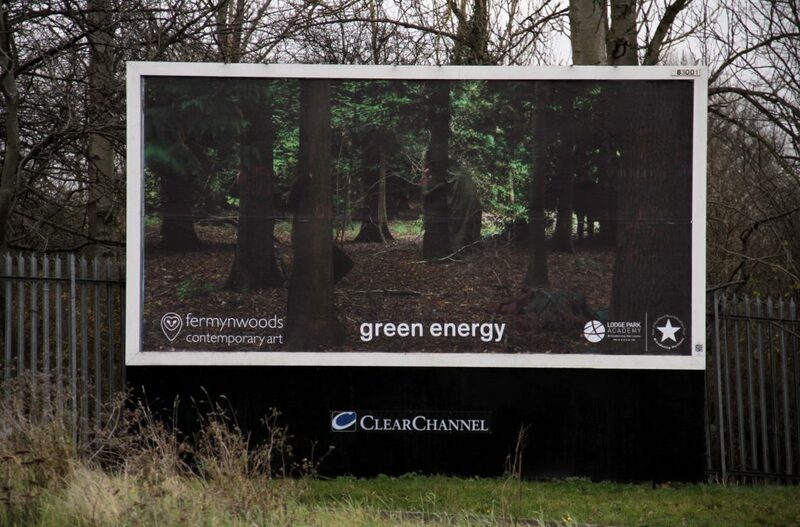 I’ve been working with Fermynwoods Contemporary Art for the past 12 years, but became Director a year ago. Before then, some of the artists we worked with referred to me as the curator of their residencies and installations. It’s only more recently that I’d perhaps take ownership of the word curation, although with Fermynwoods it is still very much a team effort, whoever’s overarching vision it may be. Interestingly, my predecessor at Fermynwoods Yasmin Canvin is a curator and would argue she is not an artist (although I would disagree). Certainly there is a difference between the curation of art and the art of curation. I also have several years of experience at London Metropolitan University where you might say I curate the showreel of time-based media for the summer show each year. I’m still unpacking why I struggle with the egotistical nature of the term curator, whereas I’ve DJed for many years (essentially organising individual works together to be more than the sum of their parts and speak to people individually and as a whole). I’m more than happy to take credit for the curation of a DJ set, although that kind of sampler culture is more democratic by it’s nature. What’s happening behind the scenes at the moment? That’s a timely question. For many years Fermynwoods have operated as a peripatetic organisation and our venues have been anything from the woods to town centres, canals, the earth’s atmosphere, and so on. 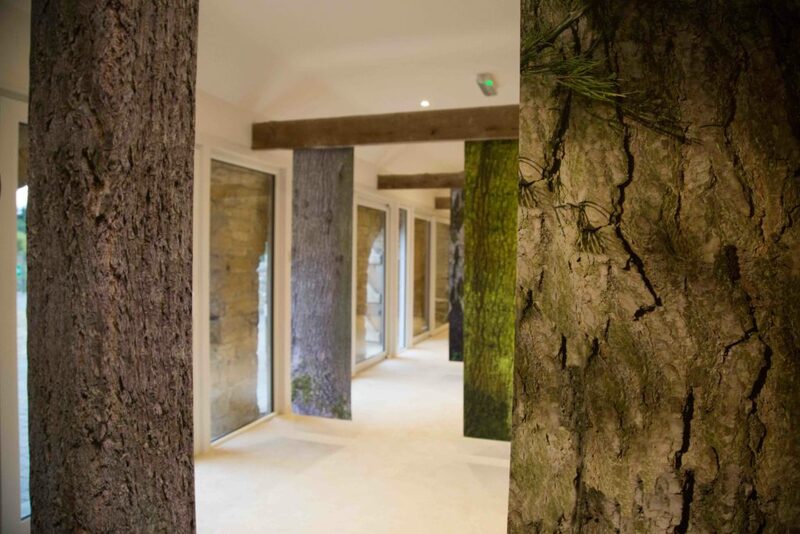 In September 2018, we opened The Arches at Fineshade Wood, a public-facing venue at the Forestry Commission’s regional base on the eastern edge of Northamptonshire. Who are the artists and/or partners that you’re working with at the moment? At The Arches we are currently exhibiting the outcomes of Justin Carter’s residency. Justin’s body of work, Blood From Stone, is inspired by the regional relationship between Oak and Ore. During his research, Justin identified Fineshade as an area of ancient industry, iron smelters having been fuelled by the abundance of wood fuel from Rockingham Forest. Transforming this historic relationship to the visual, Justin combined oak galls and bark from the landscape with rust removed from local ironstone quarries’ dragline buckets to make iron gall ink. The exhibition presents a series of klecksographic prints (also known as inkblots) made from the ink. 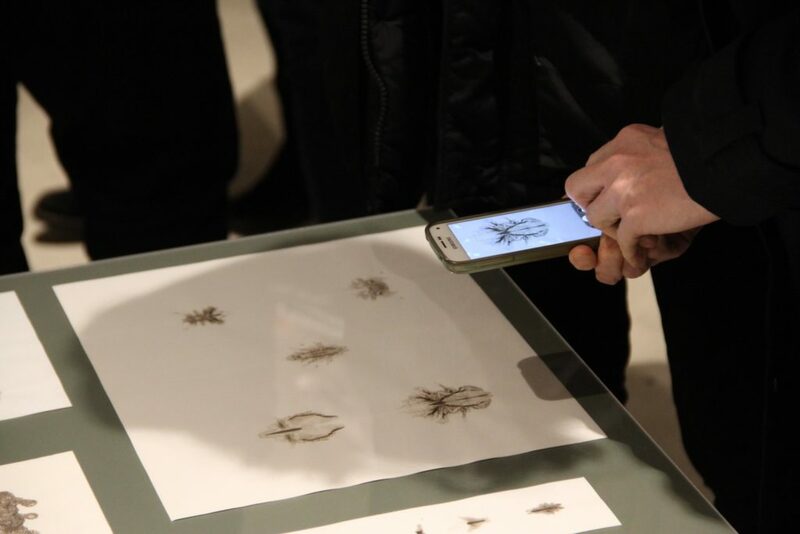 They suggest various lifeforms, from zoological specimens to human portraits – the ink literally emerging from the surrounding rocks and trees. In addition to support from the Forestry Commission, this project has involved Corby Borough Council and East Carlton Countryside Park, Corby Library and Archives, inspiration from Darwin’s beetle box at Cambridge University, and support Glasgow School of Art where Justin is Reader in Contemporary Practice: Art & Environment and Lecturer in Sculpture & Environmental Art. We are midway through our current programme, The Forest is the Museum, which is a series of artists in residence at Fineshade Wood. The Arches sit at the heart of it but the work extends conceptually and physically into the forest itself. Behind the scenes, we are working on our forthcoming Fineshade residency with artist collective Owl Project, as well as starting to formulate plans for 2020 and beyond. Our education programme is ever present, especially our work with students excluded from mainstream education. This is a crucible that is carefully curated as there are a lot of volatile elements in the room. I like how the honesty of the students helps artists reduce down the essence of their practice. 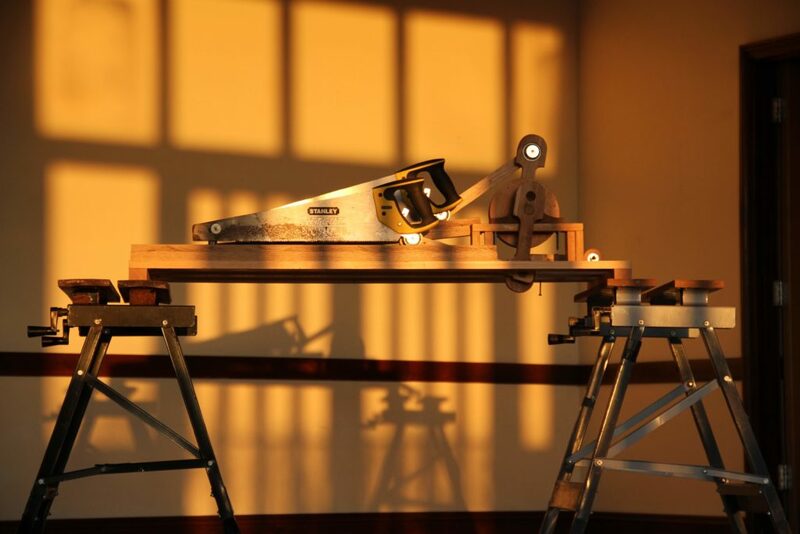 Our next artists in residence for the Forest is the Museum are Owl Project. Coincidentally, they are some of the artists who have credited me with curating their previous residency with Fermynwoods, suggesting I was a curator of geeks – which I rather liked the sound of. 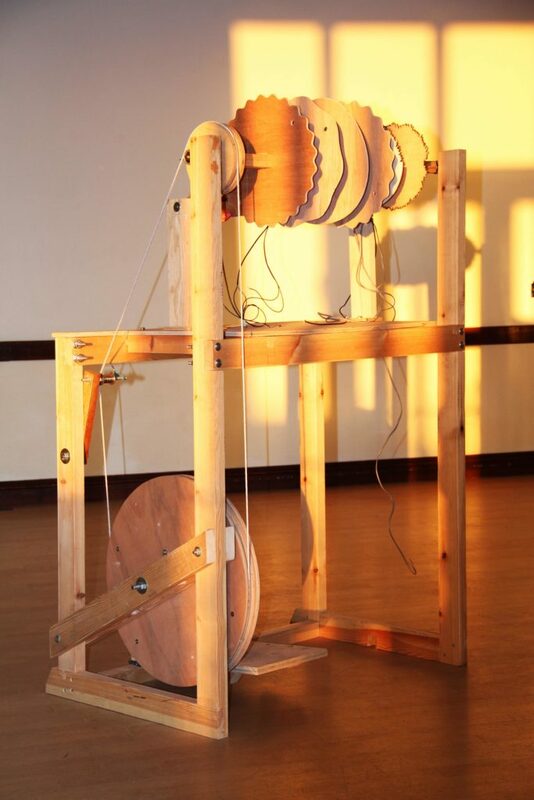 Owl Project are Simon Blackmore, Antony Hall and Steve Symons; a collaborative group of artists who work with wood and electronics to fuse sculpture and sound art, creating music-making machines and objects which combine pre-steam and digital technology. 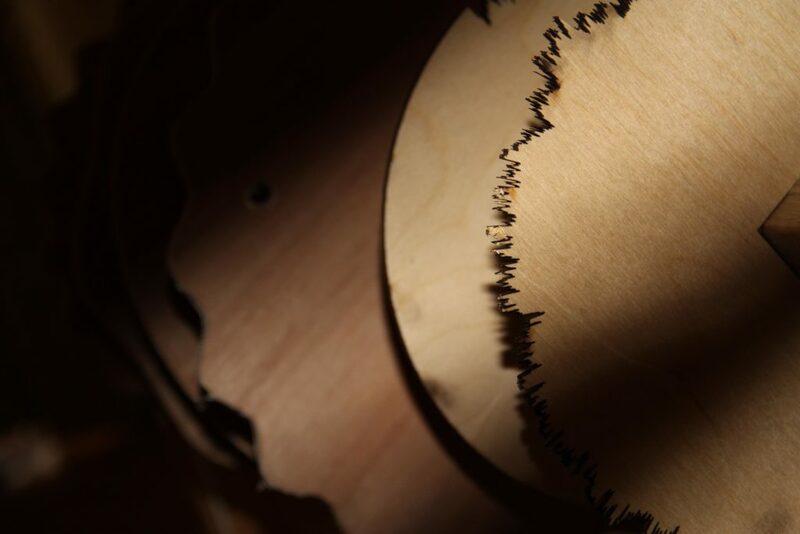 Back in 2012, when we infiltrated Brigstock Saw Mill, the giant saw blades inspired them to invent a series of beautiful, wooden, treadle-powered music-making machines, a play on the idea of sawtooth sound waves. 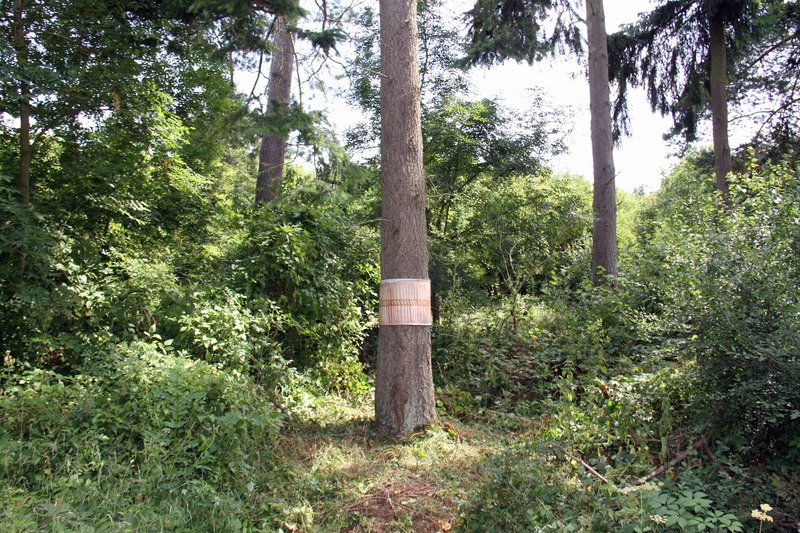 They are hoping to use their residency in Fineshade Wood as an opportunity to make new work, moving away slightly from just wood and electronics. Informed by the location, they are exploring the potential of stone age technology, so fire and metal may feature this time. We like to keep the residencies open-ended rather than use them as opportunities to just realise predetermined work, but imagine the world of Raspberry Pis, Arduinos and Internet radio colliding with smelting iron. The most organic way is by being immersed in the art world and finding artists and artistic activity that resonate in some way. To those outside the sector I can imagine this sounds quite indulgent but it actually requires some discipline, as it is too easy to get drawn into the operational side of running an arts organisation and forget to see any art. We’ve had discussions at board level about which should come first, strategic decisions or programming decisions, but the truth is they both happen at the same time, particularly when you are working in the public realm and the variables are changing with every intervention. That for me is the art of curation. I’ve heard the relationship between curator and artist described like that between a cat and a mouse, cats preferring the chase to the capture. The suggestion is curators like to discover artists rather than have artists approach them. That is interesting for me an artist. Generally, I would say the quality of work being proposed by artists approaching Fermynwoods is not as high as that from artists that we would reach out to, but that is partly because we’ve already gone through that quality control filter, and also because artists of a certain level have generally established something of a practice and don’t need to push their work so strongly. But as a cat lover I’m certainly not averse to approaches by artists that have done their research on us. It may be that they are not right for a particular moment but the first step to a working relationship is knowing of their existence. Open calls with a tight brief can also be useful as it can introduce you to artists that you might not already be aware of. I also enjoy how Fermynwoods have “gone around the circle” again with artists we’ve worked with previously to develop deeper relationships and to try things which are new for us both. For example, Virginie Litzler comes to mind. We’ve worked with Virginie since 2012 but it is only quite recently that we actually tried taking what might be described as her urban practice and putting it into the woods – a familiar tactic at Fermynwoods. We also have a white board in the office where the whole team can nominate artists and thematic ideas to a wish list. This broadens the scope and diversity of our programming and I can already see how certain ideas could fit future activity. We’ll be changing over from Justin Carter to Owl Project in April, and have a few other events to be confirmed around then too. Our next Wild Sharing peer to peer learning workshop taking place at our residency site in Fermyn Woods will be led by artist James Smith, expanding pinhole photography to 360°. I’m also particularly excited about our Art + The Anthropocene Free Exchange discussion with artist Rob Miller, which we’ll be holding as a fireside gathering in Fineshade Wood in March. Look out for details on our website and newsletter. I’m really looking forward to seeing the film that Jenny Holt is producing, exploring tensions between Thrapston as a historically rural, farming community and its recent development as a site for internationally-networked distribution hubs, examining the impact of this on rural landscapes and lives. 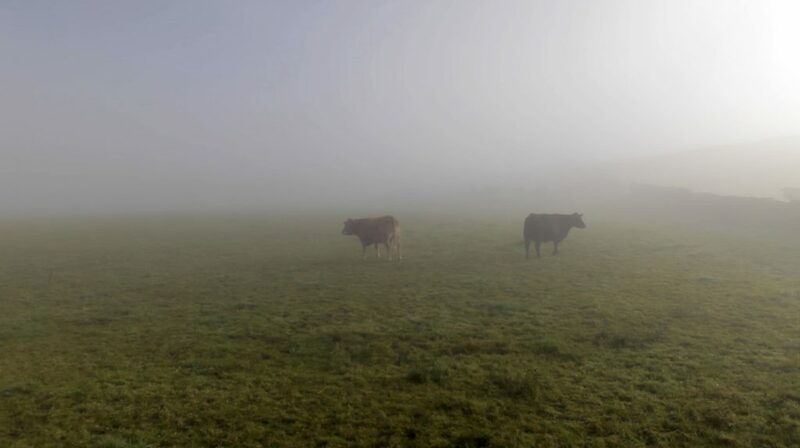 This is part of WORK, a collaboration with Animate Projects exploring ideas and the realities of what work means for the way we live today, engaging directly with the experiences of contemporary working lives. Jenny was selected by Gary Thomas and Abigail Addison from Animate and me from an open call. There were lots of reasons why we thought Jenny was the artist to work with but I gave her an extra point because her work spoke to me in a way that can’t be captured in an interview matrix or on an application form. A still from one of her past films has provided me with enough inspiration to persevere through difficult moments, and reminded me what we do these jobs for. It turns out we have a shared appreciation of the director Gideon Koppel. This is from just a single frame. Imagine what the whole film will be like. I’m also excited by the forthcoming summer residency at Fineshade, which will be shared between Abigail Lane and Lala Meredith-Vula. The YBA movement had a profound affect on me, growing up in the Brit Pop era. I remember Abigail’s work from the infamous Sensation exhibition. But as I’ve grown older I’ve become quite disillusioned by the capitalist side to it all. I’m more interested in art having effects on people rather than artists just producing commodities for rich people to grow bored of. But when I visited Abigail’s studio it was obvious that she had something special about her and the work she was playing with reminded me of why I got so excited about art in the first place. Perhaps this comes back to being an artist, but the question about space excites me far more than the question about who I’d most like to work with. For example Jill Magid’s residency with the Dutch secret service was fascinating. It also fits with Fermynwoods tradition of working in diverse and unusual locations. A few years ago I was invited to a primary school to help their children be more ambitious in questioning what art can be and where it might be found. At the start of the day I asked the children, “Where can you find art?” The answers were mostly limited to “in a gallery or a museum”. After a whistle-stop tour of some of Fermynwoods past projects I asked the question again. This time the answers were so diverse that we turned it into a competition to find the most adventurous suggestions. Under the ground. Inside the human body. Where a natural disaster has happened. A projection on the Prime Minister’s face. I’d love to curate many of these. In terms of who, they say don’t meet your heroes so I’m leaving Marina Abramovic off the list. If I could turn back time I’d love to have been involved in Wafaa Bilal’s Domestic Tension project. Luke Jerram was the first name I wrote on the wishlist, but in the East Midlands Michael Sanders is someone I find really interesting. Mona Hatoum in the woods would be incredible and I’d also like to see what Pierre Huyghe would do with our mission of infiltrating the everyday. As for the rest of the list, you will have to watch this space. Education. Access. Ethics. Diversity. Creative Risks. Protest. Money. You can imagine how the presence or lack of one could inform the other. But I would also say people need to make more of an effort and stop waiting for the ideal moment to make, curate or experience art to arrive. In Northamptonshire I think access is a problem. This is partly due to the fragmented nature of the county and poor transport infrastructure. As we often work in rural locations, the loss of rural bus routes is a big issue. We try to combat this by taking art to audiences or even infiltrating workplaces. Having grown up in Corby, I’ve seen cultural exodus first hand. It’s one thing for audiences to struggle with access but for artists who have already made a commitment to cultural engagement they need to do more to be the change they want to see. It is no surprise to me that the artists with the most momentum in the region seem to be the ones making things happen in arts organisations instead of hiding away waiting to be discovered. I do have real concerns about the financial stability of Northamptonshire, with a bankrupt county council. But perhaps this could be a Weimar period for Northamptonshire artists? James was interviewed in February 2019. All images are by and courtesy of the artist and Fermynwoods Contemporary Art, except where stated.